1. 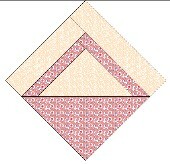 Stitch B and C to A; trim ends even with the bottom of the triangle. 2. Stitch D to this unit. 3. Stitch on E and F.
4. Stitch H to G; repeat but reverse H. Stitch these to the basket unit. 6. 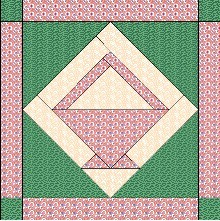 Stitch a J triangle to opposite sides of basket unit; press. Stitch remaining two J triangles. 7. 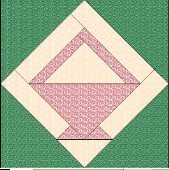 Stitch a border to opposite sides of the basket unit. 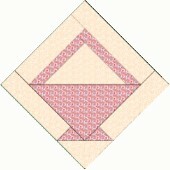 Stitch a cornerstone to each end of two of the borders. Stitch to block to finish.